The Donegan boasts a sophisticated design with casual appeal. As part of the Hunger Designer Series, this fan showcases high-end finishes and rustic features with a subtle nod to Western style. The powerful motor and 60 in. blades will keep the air moving in large and great rooms, and the dimmable LED bulbs in the bowl light fixture are fully adjustable to always meet your needs. Dont forget to check out the full Donegan collection to see the huge variety of choices � including finishes, sizes, lighting options, and more � and youll be able to carry a consistent design theme throughout every room. 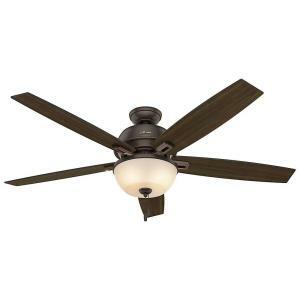 Tbook.com crawls the web to find the best prices and availability on Hunter Fanss and related Tools and Hardware products like Hunter Donegan 60 in LED Indoor Onyx Bengal Bronze Ceiling Fan with Light Kit. For this page, related items include products we find that match the following keywords: "Hunter Fan" at our vendor partner Home Depot. Hunter Donegan 60 in LED Indoor Onyx Bengal Bronze Ceiling Fan with Light Kit is one of 151 Hunter Fanss and related products listed in the Tools and Hardware section of Tbook.com If you have any questions on this product, please give us a call at 734-971-1210 during the hours of 9am - 5pm EST for assistance. Thank you for shopping at Tbook.com, the Internet Department Store!